Join us Tuesday 9/13! Some of AYC’s most experienced, longtime members will be in the spotlight for September’s membership meeting, Tuesday, September 13 at 7pm at the newly-named Caddy Shack @ Rolling Hills (same place as always but with a new name), 1415 N Mill Ave., Tempe. The club has been big and active nearly all of its 53 years and you’ll enjoy tapping into the stories from those earlier days, including some decidedly Blunder Bucket-worthy events. 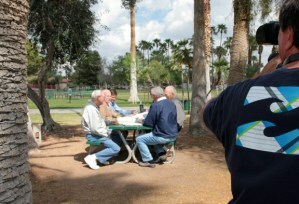 In March we gathered seven of the club’s veterans around a picnic table and asked them to reminisce. We recorded the conversation on HDTV video and I’ve now edited the digits down to about 11 minutes of the choicest nuggets. We’ll play the recording and then let the crowd try to deny it all. This is a great opportunity for newer members to tap into the history of the club, to learn about what came before and to appreciate what these people did to keep sailing vibrant in the middle of the desert.